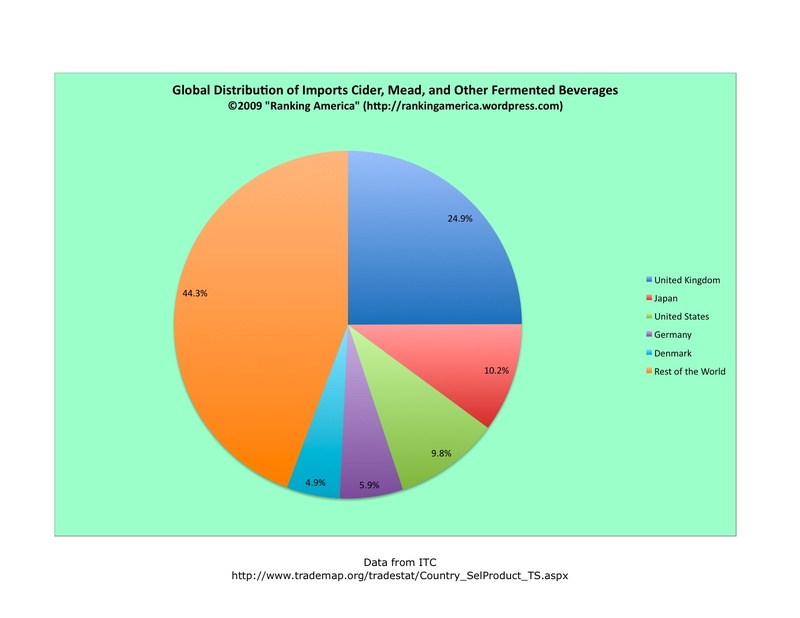 According to the International Trade Centre, in 2007 the United States imported $69,002,000 worth of cider, mead, perry, and other, similar, fermented beverages, or 9.8% of the world total. That’s enough to make the United States rank third in that category. The United Kingdom ranks first, importing 24.9% of the world total. According to the United Nations Human Development Report, 2009, the United States had an emigration rate of 0.8% between 2000 and 2002, which makes the United States tied with India and Tanzania for one hundred and seventy fourth out of 182 countries in that category. Antigua and Barbuda ranks first, with an emigration rate of 45.3%. 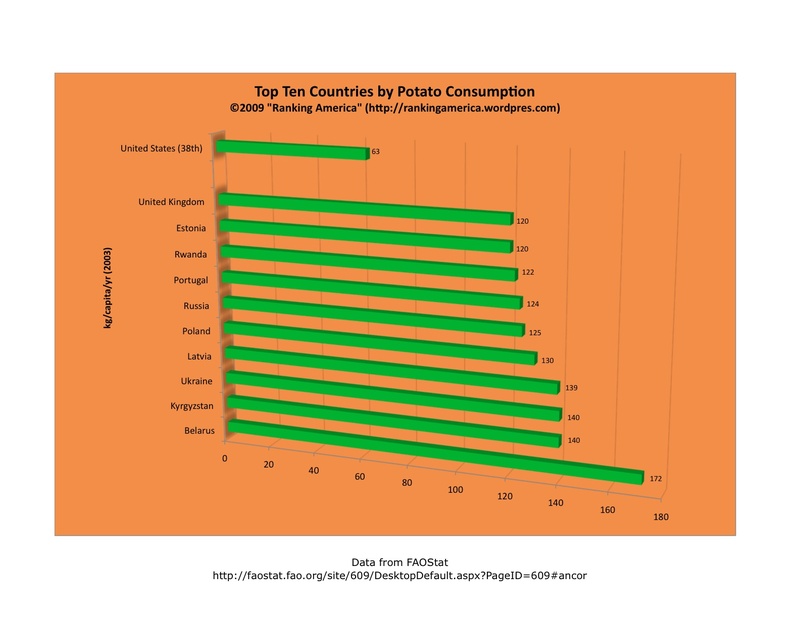 According to the Food and Agricultural Organization of the United Nations, in 2003 Americans consumed 63 kilograms per capita of potatoes, which was enough to make the United States rank thirty-eighth out of 176 countries in that category. Belarus ranked first, consuming 172 kilograms per capita. According to the Food and Agricultural Organization of the United Nations, in 2007 the United States exported 8,220,000 head of turkey, or 8.4% of the world’s total turkey exports, which was enough to make the United States rank third in that category. Thailand ranked first, exporting 32,100,000 head, or 32.9% of the world total. 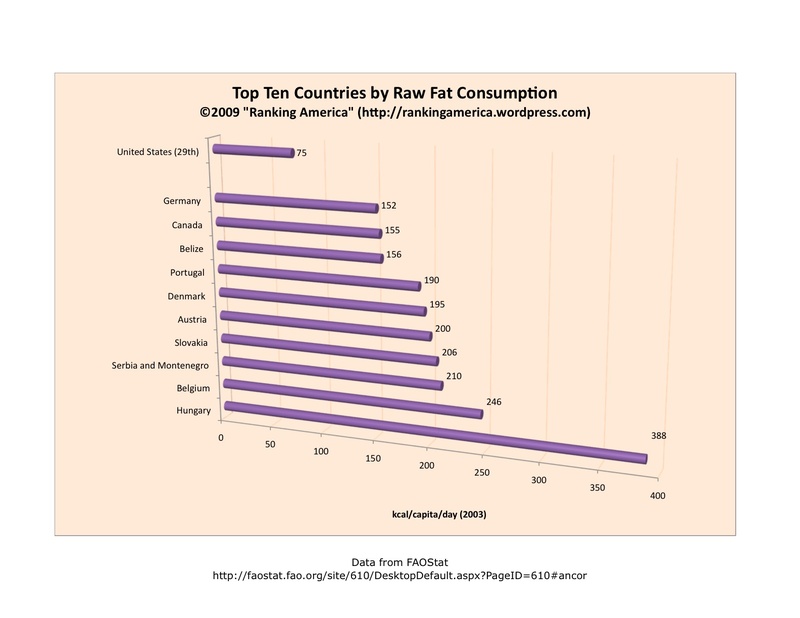 According to the Food and Agricultural Organization of the United Nations, in 2003 Americans consumed 75 kcal of raw fat per capita per day in 2003, which made the United States rank twenty-ninth in that category. Hungary ranked first, consuming 388 kcal/capita/day. 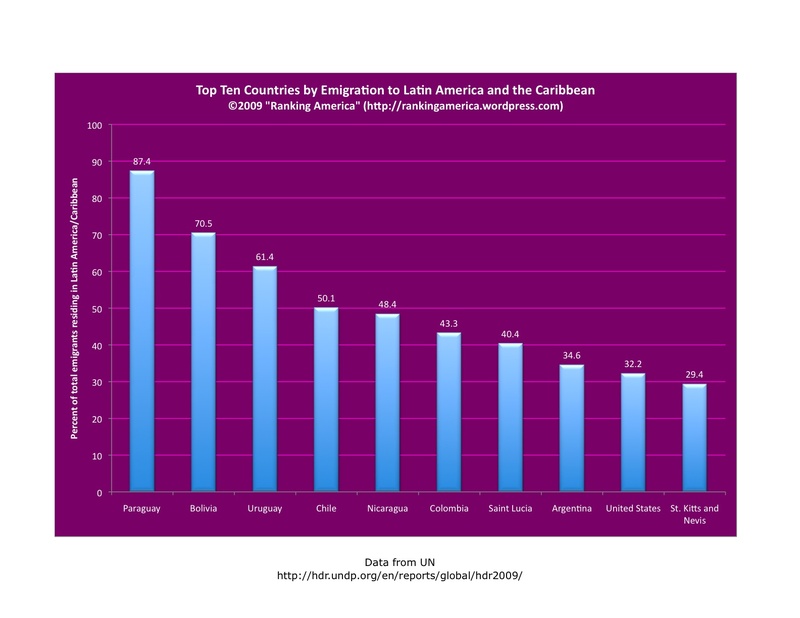 According to the 2009 United Nations Human Development Report, 32.2% of all emigrants from the United States reside in Latin America or the Caribbean, which makes the United States rank ninth out of 182 countries in that category. Paraguay ranks first, with 87.4% of all emigrants from that country residing in Latin America or the Caribbean. According to UNESCO, there are 20 World Heritage Sites in the United States, or 2.2% of the world’s total of 890 such sites. That is enough to make the United States rank tenth in that category. Italy ranks first, with forty three such sites.